I’ve missed you, readers! I apologize for my writing absence during the last week as I was living out of a backpack (clothes and all) and didn’t have room for my laptop. It’s so good to be back, and I’m PUMPED to tell you all about my travels. Here’s how I’m going to structure this: since I didn’t write at all last week and I have three places that I went over break, instead of two blogs this week, you’ll get three! Each one will go into detail of what I did in the different places I visited. First up – Parents Week in Dublin! As I mentioned in my last post, my sister and I were blessed with the opportunity to have our parents cross the pond to see us for a bit. Let me just say I didn’t realize how much I missed them and loved their presence until the moment I saw them in Dublin. They’re my best friends and it was life changing for them to experience a taste of this chapter of my life. 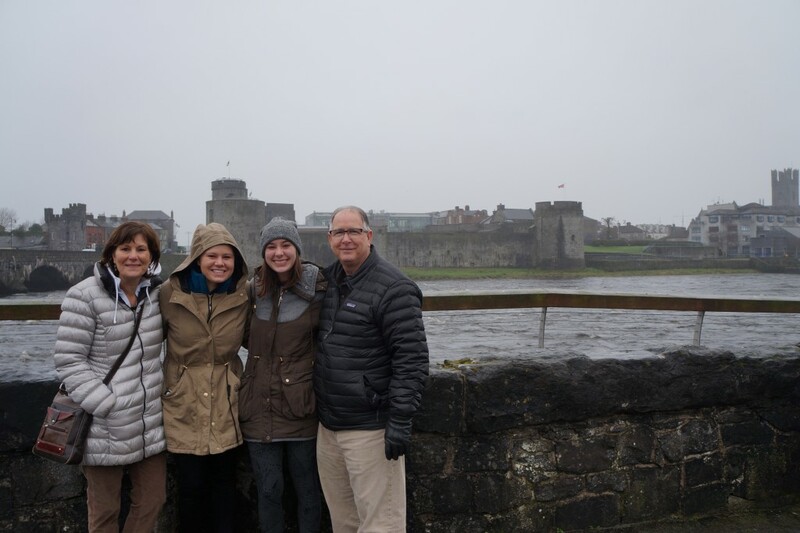 This was the first time they’d been overseas and I think Meg and I showed them the very best of Dublin. As soon as they got here last Thursday morning, we showed them our apartments so that they could see where we lived and get a better sense of the IES program. They loved it! The fam at Limerick Castle on the way to the Cliffs! Friday morning was an early one because we were off to see the Cliffs of Moher. We made a couple stops at some passing castles, but after that we were on our way! Meg and I had been to the Cliffs before, and compared to last time, it was rather cloudy and rainy. 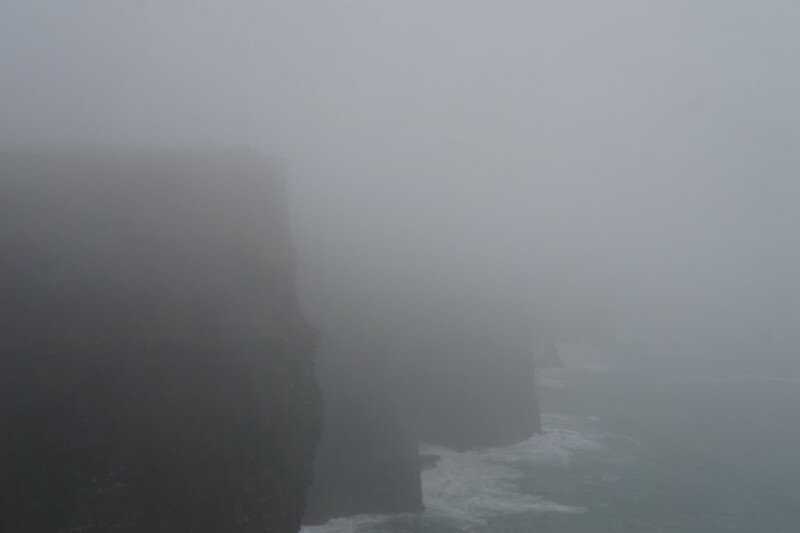 But we made the best of it and got a good ten minutes where the fog lifted and we got to see those gorgeous Cliffs! We didn’t get back until 7pm that night and ate dinner at one of my favorite pubs – The Hairy Lemon. Those very different looking Cliffs. This church was gorgeous and so intricate. Saturday was my favorite day with my parents I think. We toured Dublin Castle and Christ Church, then during the night went on a pub crawl! 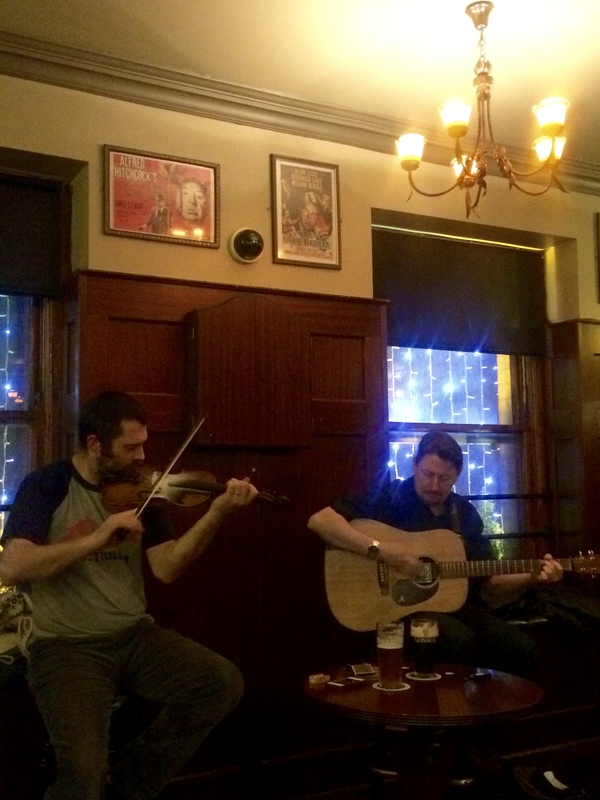 Not the usual type of pub crawl though – this one was cozy, intimate and led by two musicians who played and taught us about traditional Irish music. It was all very tasteful – just my cup of Irish tea! We stopped at three local pubs and it was one of my favorite nights in Dublin so far. 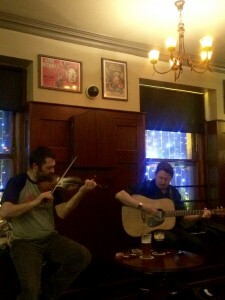 We all crowded into an upstairs pub and listened to the traditional songs that Andy and Booster played for us! 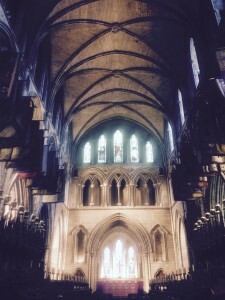 Sunday was our last day in Dublin, and it was a perfect ending. 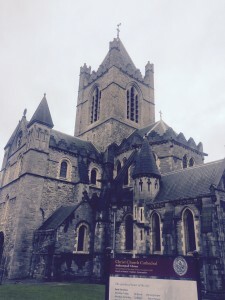 We toured Kilmainham Gaol and St. Patrick’s Cathedral, then stopped for a sweet treat at The Queen of Tarts, rounding out the day with a nice dinner before we headed out of the country the next morning. Just a little different than Christ Church. I couldn’t stop smiling the whole trip because my two favorite people were in my favorite place! It was refreshing and relaxing – everything a break should be. Stay tuned for details about Austria!! Previous Previous post: Why English as a Major? Why Writing?